Yushima Tenjin has been known to many local people as “Plum Plaza” since the Edo period. 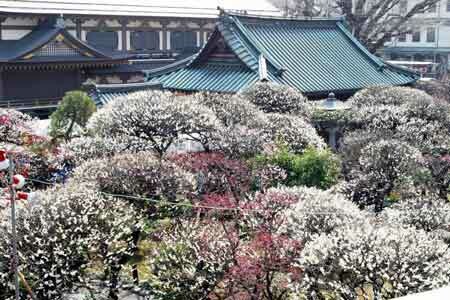 The first plum blossom festival at Yushima Tenjin was held in 1964, so this year they are celebrating 62 years. Each year the event has grown in popularity and is now one of Tokyo’s most famous plum blossom festivals. It can get crowded with a total of 400,000 people visiting during the 1 month period. It is always reported on in the newspapers, TV and radio. In October 1478, Oota Dokan(1432-86), a war lord in Kanto region, made the shrine building anew. Since then, many scholars and writers including Hayashi Doshun and Arai Hakuseki Confucian scholars in Edo period, have worshiped at this shrine.